And as part of teh celbration, I was asked to demo a recipe of my choosing from the book. 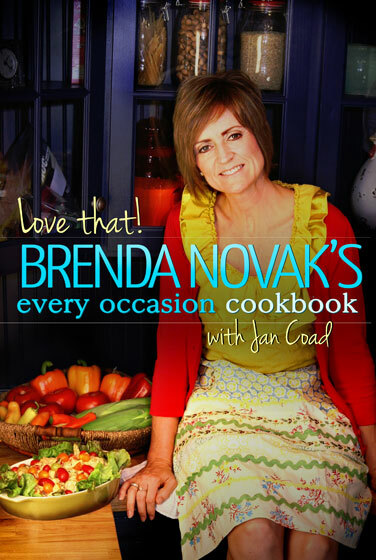 It's a beautiful cookbook and I had a hard time choosing because I love to cook, but decided to go with one of my favorte things--salad. Here are the posts from the facebook event. Just me and my makeshift selfie stick. The recipe was really tasty and easy. Let me know if you try it! First, I’d like to preface this by saying that this weekend my husband and kidlet are out of town at the NASCAR race in Talledega. This means mommy got the weekend to herself, which is great—until I realized I was supposed to demo this recipe with pictures and had no one to take pictures, lol. So guess what makes a great selfie stick? A kid’s golf club, a big rubber band, and my phone. : ) You do what you gotta do right? I figure MacGyver would’ve been proud. 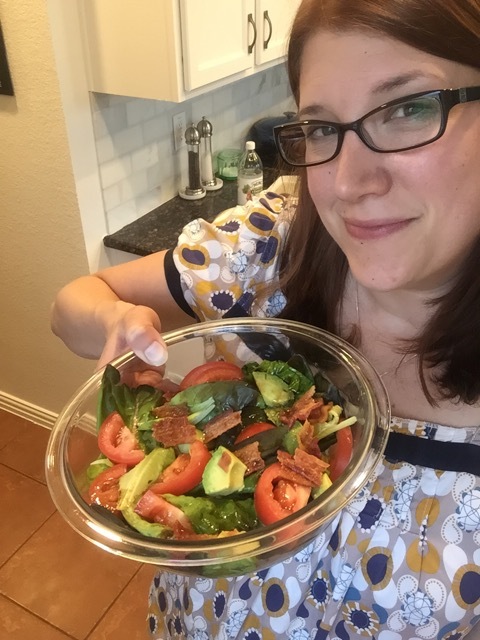 So I chose the Bacon Lettuce Tomato salad because there’s nothing easier to make at home when I’m flying solo than a yummy salad. And I happened to have all these ingredients on hand, which is nice because you can throw it together very easily. 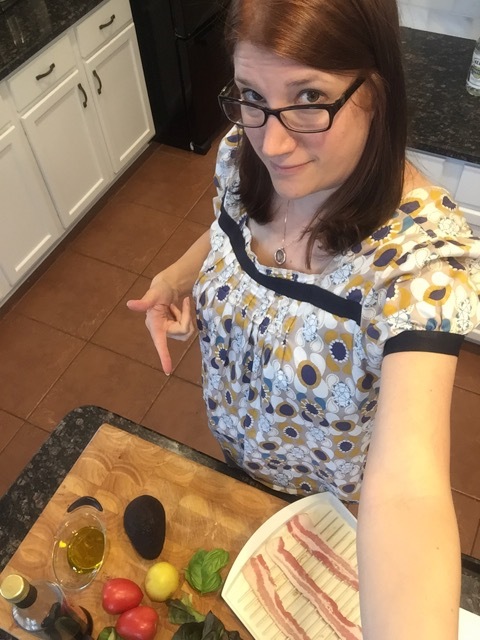 Plus, it has two of my favorite things: avocado and bacon! 1. 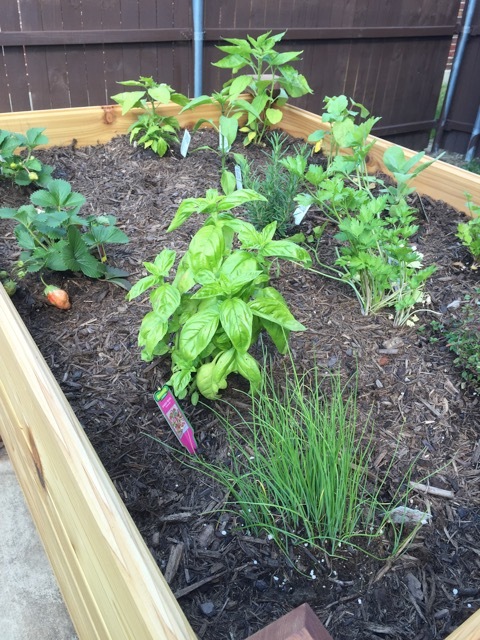 First I grabbed some fresh basil from the little garden I started this spring since the dressing called for basil. You could probably put any herb you want in the dressing. Cilantro would be yummy. Or even use dried herbs if you’re in a pinch. 2. Then I got all of my stuff ready to go. I think chefs call it mise en place. I love to cook and I’m usually excellent at doing this part—organizing upfront. But then my husband will tell you that afterwards, all goes to hell because then it’s like the Tasmanian devil once the cooking starts. It’s not uncommon for me to cover every surface in the kitchen before I’m done, lol. 3. I washed and dried my lettuce in the salad spinner. 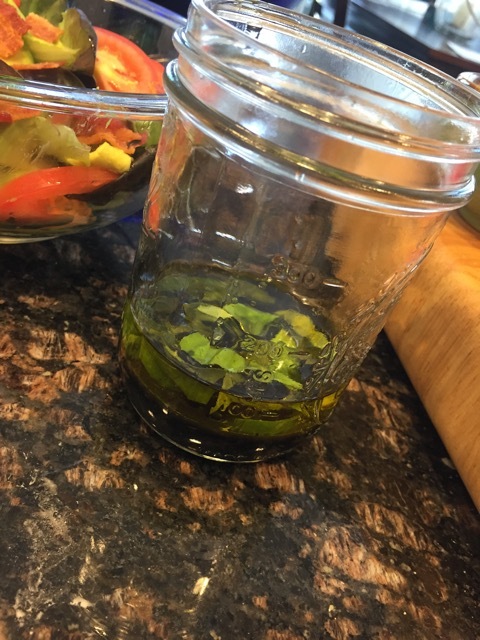 You want to make sure it’s mostly dry so the dressing will stick. 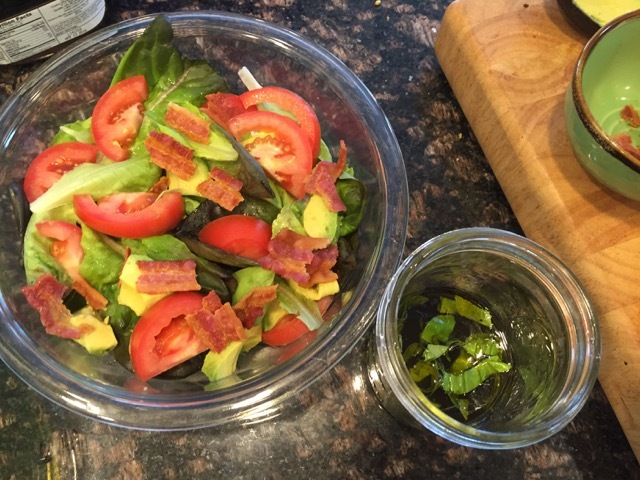 And I used baby red lettuce because that’s what came in my produce co-op share this week. But any lettuce you like would work. 4. Chop all your good stuff up. 5. Put everything but the dressing in a bowl. 6. 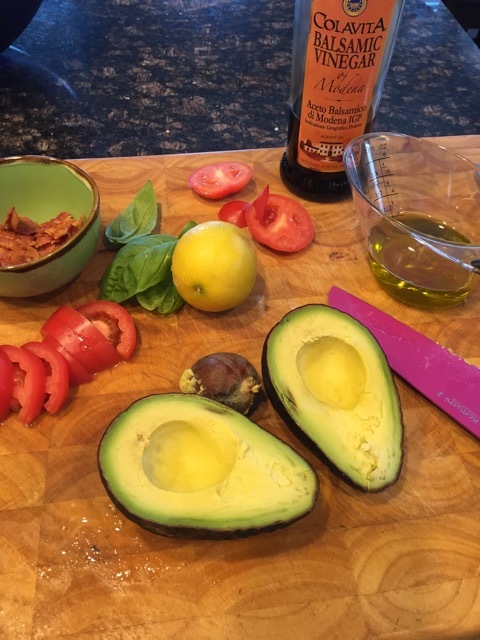 Mix your dressing ingredients together. 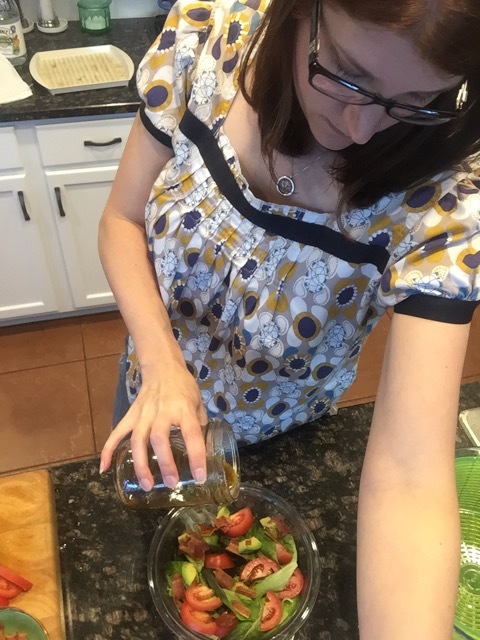 My tip for that is if you have a mason jar (or tupperware container), dump everything in there, pop the lid on tight, and just shake it up (bonus points if you sing the Taylor Swift song while doing it). I find it quicker and cleaner than bothering with a bowl and a whisk. And if you have leftovers, it’s easy to store. 8. EAT! :) It was delish.